A perforated eardrum is usually caused by trauma or infection. As a result of acid or hot slag (from welding) entering the ear canal. 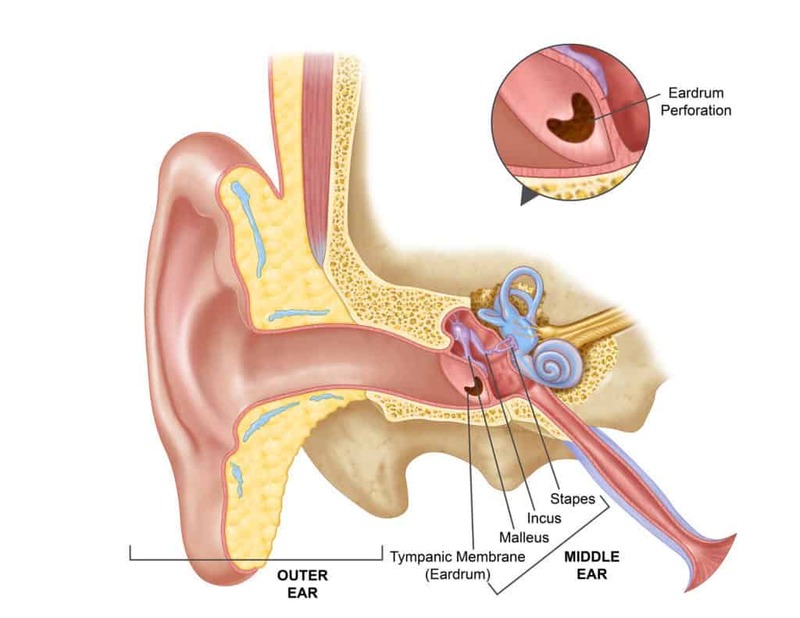 Middle ear infections may cause pain, hearing loss, and a spontaneous rupture (tear) of the eardrum. In this circumstance, there may be drainage from the ear that is infected or bloody. In medical terms, this is called otitis media with perforation. Symptoms of acute otitis media include a sense of fullness in the ear, diminished hearing, pain, and fever. Most eardrum perforations heal on their own within weeks of rupture, although some may take several months. During the healing process, the ear must be protected from water and trauma. Eardrum perforations that do not heal on their own will usually require surgery. On rare occasions where a grommet (ear tube) falls out or is removed by your doctor, a small hole may remain. The location and size of the perforation can determine the level of hearing loss, with larger holes causing greater hearing loss than smaller holes. If severe trauma (e.g. skull fracture) dislocates the bones in the middle ear or injures the inner ear structures, hearing loss can be severe. Chronic middle ear infection with perforation can also be associated with destruction of the middle ear bones. If the perforated eardrum is caused by a sudden traumatic or explosive event, the loss of hearing can be great and tinnitus (ringing in the ear) may be severe. In this case, hearing usually returns partially, and the ringing diminishes in a few days. Chronic infection as a result can cause persistent or progressive hearing loss. Before attempting any correction, a hearing test should be performed. Further testing may be required to determine if there’s an underlying cause for the perforation. It also may prevent cholesteatoma (a skin cyst in the middle ear) from developing, which can cause chronic infection and damage the ear structures. If the perforation is very small, an otolaryngologist (ear, nose, and throat specialist) may choose to observe it over time to see if it will close by itself. They might also try to patch a patient’s eardrum in the office, though if this not successful, surgery may be required. There are a different surgical techniques, but most involve grafting skin tissue across the perforation. This procedure is called a myringoplasty. Surgery is typically successful in repairing the perforation and improving hearing. It is often done on an outpatient basis. After surgery, most patients can resume work in one week. The eardrum should be fully healed within three months.